Originating in China over 4,000 years ago, wushu is time-honored, rich in content and diversified in forms. In its age-long process of development, wushu has been referred to as "martial arts", "guoshu", "gongfu" and "kung-fu". 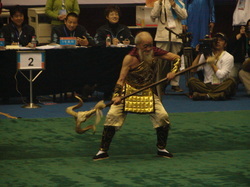 The origin of wushu can be traced back to the early activities of the ancestors of the Chinese people who struggled hard for survival．During the prolonged cold weaponry age, wushu was employed by the army to subdue the enemy, practiced by the ordinary people as a means for self-defense and physical training, as well as for a cheerful life. Wushu is rich in history and philosophy and is an important part of the Chinese people’s cultural diversity. It is the ancestor of Karate and Jujitsu, and is rapidly growing in global popularity. Wushu is diverse in styles and encompasses a variety of dimensions including self-defence, traditional art form, meditation, philosophy, health, fitness, recreation, leisure, sport and competition. Of equal importance, Wushu teaches confidence and self-esteem, particularly in young people. It fosters positive behaviours and contributes to higher levels of self and social awareness, understanding and educational achievement. It has found admiration from people of all walks of life and more importantly, it plays a pivotal role in teaching young people integrity and morality. Wushu reigns as the most popular national sport in a country of over 1.2 billion people, practiced by young and old alike. Wushu is widely practiced in over 140 countries and territories across 5 Continental Wushu Federations of Asia, Africa, Europe, America and Oceania. Modern or sport wushu is striving to find its rightful place in the arena of the Olympia through the efforts of the International Wushu Federation, and is on the shortlist as a new sport for the 2020 Olympics. Traditional wushu, the root of modern wushu, has developed according to wushu's traditional style and its own law of development. With distinctive characteristics of China's traditional sports culture, traditional wushu is now practiced globally by millions of people. It has an enormous potential for development. Its value for health-building, self-defense and cultural education is greatly appreciated by people across many different cultural backgrounds. Now it is steadily entering the domain of sport for all, as well as the leisure sports and cultural sports of the people of the world. (Competitor pictured was 90 years old). Wushu taolu is a set of connecting stylized movements choreographed according to certain laws, embodying the philosophical connotation of attack and defense. Taolu, comprising bare-handed and weapons forms, has 11 different routines that fall under 4 main categories (see below). All routines can be practiced as standard sets or with degrees of difficulty and all have specific time ranges. 4. Dui Lian: Choreographed Fights (without weapons, with weapons, and bare hands against weapons). Wushu sanda discipline involve fighting movements between two people for both attack-defense exercises. It deploys many types of fighting movements such as tuishou, duanbing and changbing. Sanda is a martial art which was originally developed by the Chinese military based upon intense study of various traditional methods and combined with modern, advanced in sports medicine and training methodology. Sanda is practiced as a combat sport, meaning that training is conducted with safety equipment and competitions are conducted under rules restricting certain tactics and techniques designed for the safety of the participants.